Studies have shown that levels of several organics average two to five times higher indoors than outdoors, and when inhaled they can contribute to several health problems. This is often a result of the toxins and fumes emitted from the majority of traditionally manufactured paint for decks, walls, and even paint for the nursery. But it's not just paints: many types of wall and wood coatings emit fumes, such as polyurethane coating. Keep reading to learn more about polyurethane coating risks and how to reduce them. What Does Polyurethane Coating Do? Polyurethane coating is typically used as a finisher for wood floors to provide them with a glossy shine. It comes in two varieties -- oil based and water based. 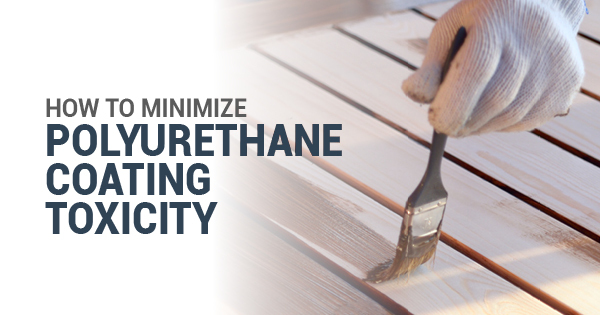 Water based polyurethane coating costs more than oil based, but it's also slightly less toxic. Though the effects of polyurethane coatings can be long lasting and provide visual improvements to the surface, it's also known to have toxic side effects. According to Sweden’s Dampness in Buildings and Health study, children with bedroom PGE concentrations in the top 25% (of the study participants) had a 100% higher likelihood of having asthma, a 150% higher likelihood of having eczema, and a 320% higher likelihood of having rhinitis. With this in mind, these toxins can come with unpleasant side effects like coughing, vomiting, shortness of breath, and headaches. Fortunately, there are plenty of low VOC paints and polyurethane coatings that are safe for use. If your flooring is more than one year old, many of the VOCs will have dissipated already. But if you're installing new flooring or painting your floor, go for an organic option and use VOC-free painting materials. Ultimately, it's your choice to determine whether you want to use traditional paints and primers and deal with the side effects of polyurethane fumes, or keep your body safe and protect the environment with low toxin alternatives. But understanding the risks can help you make your final choice. For more information about the side effects of polyurethane fumes, contact Ecos Paints.